Have you ever asked anyone what their favourite place in Vietnam is? I guarantee that at least 90% of the people you ask will say Hoi An. There are endless streets adorned with intricate lanterns, the food is easily the best in the whole country and many of the streets are closed to traffic, creating a calm place in a usually chaotic country. I have been fortunate enough to visit Hoi An twice and I’m sure I will return again in the future. It is cemented as one of my favourite places to visit in the world. There’s no better way to spend a day than to wander along Hoi An’s pretty little laneways in the sunshine and grabbing a fresh Bia Hoi to cool down every so often. This could only be challenged by taking a bicycle ride through the nearby rice fields before relaxing on the beautiful An Bang beach. But, what often isn’t captured in this beautiful image of Hoi An is the rain. And it rains a lot… Still, there’s plenty of great things to do in Hoi An come rain or shine and my favourites are below. Travelling, especially long term, can take a toll on your body. Carrying that heavy rucksack is probably not doing your back any favours and if you’re like us, you probably spend a lot of time walking about or cycling and your feet have likely seen better days! Similarly, too much time in the sun can make your skin dry (and for those who unfortunately are like me) a little spotty. On the other hand, if you’re visiting on vacation from a hectic job, you probably have a lot of tension built up, and may need a little help relaxing. Basically, what I’m trying to say is, EVERYONE deserves some spa time! From massages and body wraps to facials and manicures and everything in between you’re sure to find something to help you relax in one of Hoi An’s many spas. Massages can be as cheap as a few pounds and as expensive as £20 and I find that you often get what you pay for. The more expensive end of the spectrum often offers better, cleaner facilities and the opportunity to be treated like a princess, or prince… the spas are definitely not just for the girls! Be wary that a full body massage can often truly mean a full body… be very careful to state any limitations before hand! Hoi An is famous for it’s tailors and many people will often ask if you have had clothes made there. Whilst you can have virtually anything made, they specialise in formal wear for both men and women. If I ever have an important even to attend, I would love to return and have something special made! At this moment in time, there are no special events on the radar, my backpack is full and my budget is low so I decided to skip the tailors. That does not mean that I skipped shopping entirely! There are hundreds of lovely little shops filled with clothes, jewellery, lanterns and artwork. Expect to spend between 120,000-200,000VND for a dress or playsuit and a little less for a top. See my post on haggling here. Just a few years ago, it could be difficult for anyone over a size 8 to buy clothes to fit in this part of the world but I am happy to confirm that there is now plenty of options for my size 12 behind and I have a dress and playsuit to prove it! It’s not quite the broad spectrum of sizes that we’re accustomed to in the west but with the influx of tourists it’s definitely getting there. I wrote about the wonders of Reaching Out on my last post about Hoi An which you can read here. Reaching Out Teahouse is run by people with visual and hearing impairments and it provides them with meaningful employment. They encourage silence in the café making it such a beautiful and calm place. The coffee sampler is amazing, as is the cake sampler! It is such a good cause that I truly insist that you visit at least once during your stay in Hoi An. More about Reaching Out and the menus can be found here. If you were hoping for a more lively place to drink coffee, perhaps to write or edit photographs etc, there are an abundance of other coffee shops in Hoi An but our favourite had to be Hoi An roasters. There are quite a few dotted around the old town so it would be hard to miss one! Unfortunately, we missed the yoga session we wanted to attend due to sickness but we did enjoy a fantastic meditation class with Victoria at Nomad Yoga. Whilst Conor had previously completed a 3 day silent meditation retreat, I’m a bit of a meditation newbie. Nevertheless the class was brilliant and Victoria was easily able to cater for both of us. Best of all, the class is donation based and all proceeds go towards a chosen charity every month. What a great initiative! We were disappointed to miss the yoga class but we heard only good things! In better weather, they also offer yoga on An Bang beach in the mornings. For all availability and location info, take a look at their website here. I’m really not quite sure why Thanh Ha is featured so little on other travel blogs because this place is amazing! Filled with intricate terracotta structures, you can find everything from the Taj Mahal to the Big Ben replicated here. Venture inside into the museum and gallery to learn more about this craft before heading downstairs to the ‘market’ for the highlight of any trip. Downstairs there are artists working and for a small fee they will let you join in! Not convinced that our pottery skills would be up to standard, we chose two masks and asked to paint them. 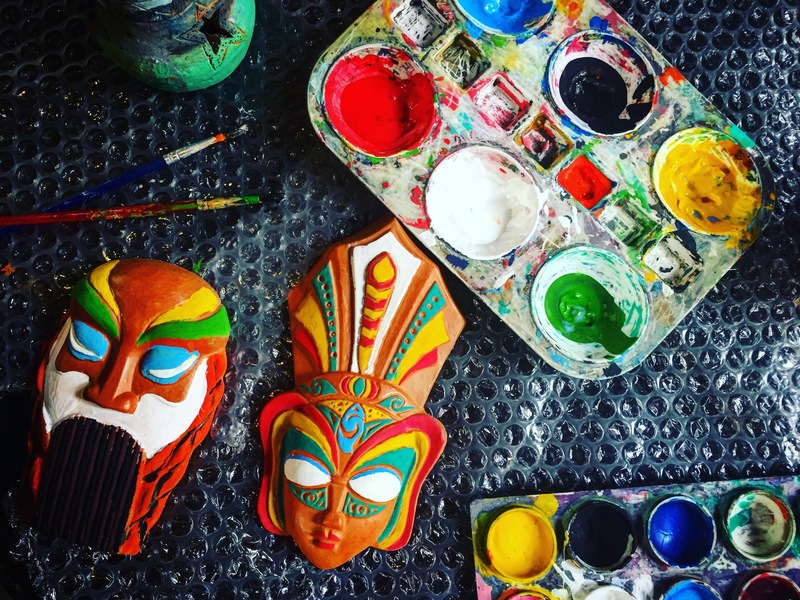 We happily spent over an hour painting the delicate little masks in enticing colours before having them wrapped up in bubble wrap and saying our prayers that they wouldn’t break in our backpacks! Entry to the park was just 30,000VND and it cost just 40,000VND for each mask, including the painting. It was one of the highlights of our Hoi An trip and I would love it to be one of yours, rain or no rain! Find out more about Thanh Ha here. So, if you’re reading this because you’ve got to Hoi An and are experiencing what feels like never ending rain, I hope I’ve helped you find something to do. If you’re visiting Hoi An and the sun is shining, I hope this still helps you to find something to do! And, to my lovely regular readers, I hope this has given you an insight into Hoi An and maybe some inspiration of fun things to do on a rainy day wherever you are. If you liked this and would like to see similar blog posts, please let me know below and if you loved it, don’t hesitate to give it a share!